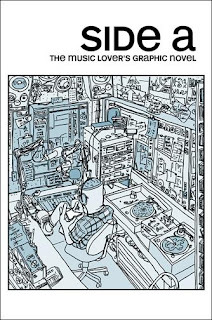 I'll admit to being initially wary of Poseur Ink's Side A: The Music Lover's Graphic Novel. I was afraid I'd be faced with story after story of people talking about where they were when they heard OH NOES, Kurt Cobain killed hisself (you three or four longtime readers may remember how little patience I have for Cobain Canonization). Thankfully, though, my fears were unfounded. The book's unifying theme - the effects of music on the lives and works of the people involved - is very broad, and the creators make the most of the freedom that allows. A few stories cover some of the expected territory - teenage musical awakenings, failed attempts at rock stardom, valentines to a particularly beloved genre, etc. - while others approach the topic from unexpected directions: artistic depictions of operatic movements, discussions of the effects certain music has on the actual comic creation process, a musical biography set to its own drum beat, the lifelong search for an odd song heard in childhood, and the hellish concert experience that actually drove two women away from feminism. 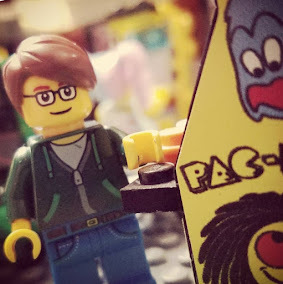 Now of course, the main strength of an anthology, the breadth of material, can also be a weakness in a lot of cases, since not everything is going to be necessarily, you know, good. Again, though, Side A does a pretty reasonable job of putting any such fears to rest. The quality may vary from story to story, and certainly some entries work better than others, but there are no real clunkers, either. I may not have liked everything, per se, but at least it was all interesting. As far as I'm concerned, that's winning the battle right there. And it was all the more impressive considering how few of the contributors I had heard of prior to this book. I was familiar with Liz Greenfield from StuffSucks.com, Tod and Cory Marie Parkhill from Young American Comics, and Ben Snakepit (whose diary comic minis are also put out by YAC), but the vast majority were entirely new to me. And I'm happy to say that I'll be looking out for some of these folks in the future, particularly :Mara Sternberg, Sarah Shay, and Rachel Dukes (Dukes was also the book's editor and mastermind). The promo copy on the back cover likens the book to a mixtape on paper*. And as anyone who has ever made or received a mixtape can tell you, it's an incredibly tricky thing to do well, and for better or worse, it can definitely influence your opinion of the person who made it. Well, Side A: The Music Lovers Graphic Novel is a good mixtape, and you'd do well to get to know the people behind it a little better. *Sigh... I miss mixtapes. CD-Rs and iPod playlists just aren't even in the same galaxy. I actually just ordered this! Nice review aside from the mini Cobain-Canonization rant...an assumption like that looked a little out of left field, a bit like trying to stretch the review. Your review definitely makes me more excited for it to get here!